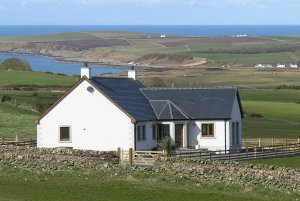 Offering panoramic views across the coast and countryside, the elevated position of Dundrum Cottage means you can enjoy some of the finest views in southern Scotland. 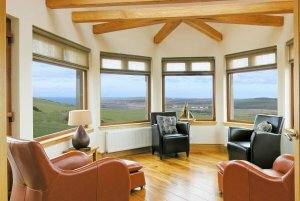 This detached, luxury self catering holiday cottage is one of the finest in Scotland, awarded five stars by VisitScotland and providing a comfortable, contemporary holiday experience for up to eight or nine people. In fact Dundrum Cottage was the first self catering property in Dumfries & Galloway to achieve the prestigious five star award! 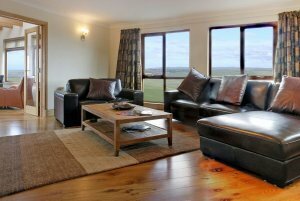 Like all our self catering cottages we’ve worked hard at making the interior space of Dundrum just as striking and enjoyable as the landscape it’s situated in. Exposed, natural wood finishes, stylish furnishings and a light, bright interior where your eye is drawn to the view from the large picture windows. Dundrum Cottage has been especially designed to make the most of the location, a highlight being the beautiful conservatory – a room in which we invite you to savour the ever changing light and landscape of this beautiful corner of Scotland. Fully equipped with everything a busy family needs to make the most of precious holiday time. Enjoy spending time together around the large, sociable dining space sharing your hopes and plans for tomorrow and your enjoyment of a day well spent. Vestibule: Coat stand and lots of space for your walking and wellie boots, leading into the hall. Hall: Large dresser with lots of brochures and information to help you enjoy your holiday. Living Area: Light, bright and spacious with very comfortable sofas. Enjoy the easy to use a wood-burning stove, a 42 in plasma television, Sky package including movies, sports, children's and Discovery channels and a DVD player. Conservatory: The ultimate relaxation room with amazing views over the ever changing seascape and sky. Featuring a music system with iPod connection we invite you to pour yourself a drink, relax and watch the sun slowly sink below the horizon. 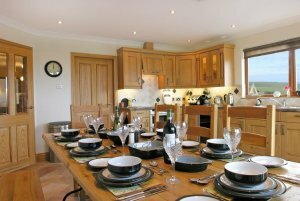 Dining Kitchen: Beautifully finished with oak cabinets and fitted with appliances you might require. The farmhouse table comfortably seats ten and is positioned in front of a large, low window that offers fantastic views. Master Bedroom: King-size bed and contemporary en-suite shower room. 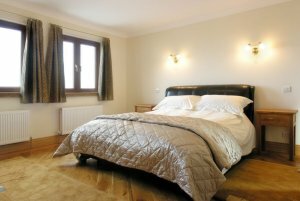 Double Room: Spacious double bedroom with en-suite shower room. Twin Bedroom: Two comfortable single beds. Bunk Bedroom: Featuring adult sized bunk-beds. A z-bed can be added to the bunk room if required. Main Bathroom: Beautifully finished contemporary bathroom featuring a large double ended spa bath with underwater lighting and cushion head rests at both ends. Enjoy! Garden: A large enclosed garden with ample parking. Patio: Accessed by the conservatory, with comfortable outside furniture and a barbecue for al fresco dining. Comfort: Dundrum is fully double glazed and centrally heated, warm and cosy all year round. Pets: Dundrum is a Pet Free Cottage, pets are not allowed.